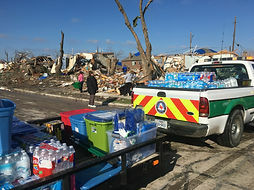 The City of Rowlett has set the pace for communities around Texas as one of the first cities in North Central Texas to implement the federal government’s initiative for Community Emergency Response Teams (CERT). The program has trained more than 1,000 CERT volunteers and has been recognized by the Federal Emergency Management Agency for its excellence and program management. 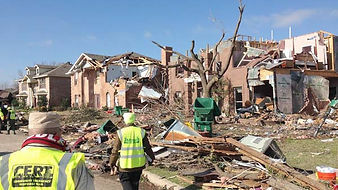 The Rowlett CERT program is well established and integrated into Rowlett’s Emergency Plan. 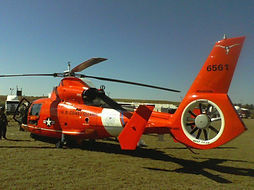 It serves an essential role in disaster preparedness and emergency response in the Rowlett area. Rowlett CERT is also an essential component of large city events in providing: access and traffic control, fire watch, courtesy patrols, communications and information technology services, first aid stations, public information and education. 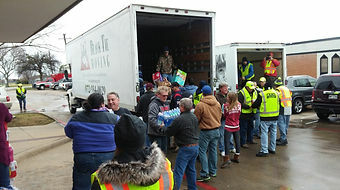 Background: Rowlett CERT is co-sponsored by the Rowlett Fire Department and the Rowlett Citizen Corps Council. 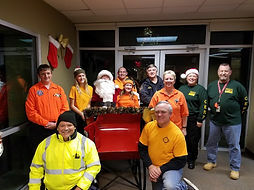 It was formed in late 2002 in response to the need for citizen involvement in volunteer programs that help make our community safer, stronger and better prepared for any emergency or disaster. ​Current State: Rowlett CERT has trained over 1,000 citizens cumulatively in over 75 CERT G317 classes since 2002. 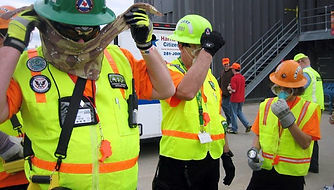 ​Leadership: The program is led by the CERT Director, who appoints the CERT Leadership Team (CLT). The CLT is composed of a Deputy Director/Training Coordinator, Communications Coordinator, Special Training Coordinator, Technology Coordinator and Subject Matter Specialists. The CERT Director is a standing member of the RCCC Board of Directors. ​Activation: Responsibility for the deployment for CERT resides with the EOC, Incident Commander, Fire or Police Chief, or Emergency Management Coordinator for the City of Rowlett, and is initiated by Police/Fire Communications. A leadership team of six individuals are on the activation list (via text and phone). The on-call leader activates all or a portion of the CERT group depending on the nature and extent of the activation. Our members are activated primarily by use of an automated call-tree service (One Call Now) that can be activated by telephone or a website text-to-speech system. Using this service we can quickly and easily notify all of our members in under two minutes. ​Equipment: All CERT course graduates that remain active in the Rowlett program are issued a basic CERT Kit and program shirts at no cost. The RCCC maintains a 2001 F250 SD truck with a service body for towing the primary CERT trailer and heavy equipment trailer. The service body truck carries equipment such as traffic control items, a generator inverter, medical supplies, hand tools, chain saw kits, and lighting. In 2012, with FY10 grant funds, the RCCC placed in service a 6x10 trailer to be used as a secondary response trailer. From lessons learned during the December 2015 tornado, the trailer has been converted to a heavy equipment trailer that is able to navigate congested access ways. The trailer is equipped with two chain saw kits, heavy hand tools and log rollers, brushfire hand tools and sprayers, cribbing kits and levers, and utility control tools. Additionally, CERT continues to maintain the primary CERT support trailer that not only contains enough resources to respond to and equip a large incident, but also contains Wi-Fi capability, desktop computer, printer, digital TV, weather monitoring equipment, amateur and VHF communications, and a command module. 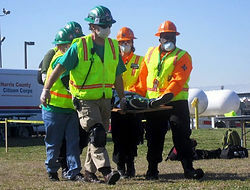 ​Training: Rowlett CERT teaches two G317 classes each year using volunteer instructors and subject matter experts. Additional classes are supported through our partner program EastTex CERT. In addition to the CERT G317 course, members are encouraged to take additional training including: Search and Rescue Basics, Wide Area Search, Communications, Disaster Damage Assessment, SkyWarn, as well as First Aid and CPR. Annually we conduct two scenario based drills and two skills oriented drills. Monthly meetings are also held in which a short training topic is presented with topics that reinforce the basic G-317 curriculum. Online training through the Emergency Management Institute and other sources is available for those who want additional training. We require our members to complete the IS-315 ICS for CERT, and encourage them to complete the IS-700 NIMS and IS-800 NRP courses online. Internally, G317 courses are offered twice a year, each completed in two ten-hour days. 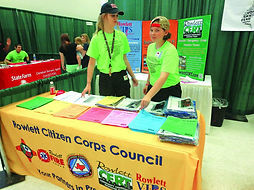 Rowlett CERT also conducts out-of-City G-317 classes as requested by other municipalities or Citizens Corps Councils. The accelerated course is the format of choice for our program. Each graduate also receives a certificate and a brochure listing resources and links to FEMA sites, training, and useful apps. Students who wish to join our program complete a Waiver of Liability, Driver’s License & Background Check, and CERT Profile form and attend an orientation session held at a later date. The orientation session introduces members to radio operations, suspicious persons / packages, call out procedures, and traffic control. ​Recruitment & Retention: Our program boasts a high retention rate that may be attributed to a multi-disciplined program which offers ample opportunities for involvement at various levels. Recent statistics show the average tenure of members to be around three years. Additionally, we have seen a large outpouring of citizens requesting to take the G-317 in response to the tornado. We instill values of ownership, empowerment, community action and volunteerism through our umbrella of Citizen Corps programs. All of our programs enjoy a high cross-training rate among their volunteers which helps us to be more integrated. We have a robust awards program where we recognize our top volunteers annually at a banquet. 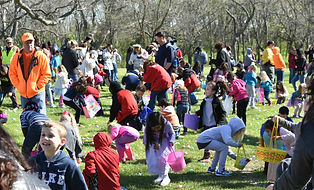 ​Since 2003 Rowlett CERT has provided over 50,000 hours of volunteer service to Rowlett and other communities.